I just finished cleaning up the sunroom after making my first kokedama. Kokedama is a Japanese word that translates into English as "moss balls" though all the auto-correct editors want to translate it into chokedamp. The idea is to mix a combination of peat and clay soil, generally a 70-30 ratio, so you can form the soil into a ball and it stays as a ball. Then you plant something in the ball, generally a plant that will like the same moist conditions moss likes, and cover the ball with green moss, using string to keep it all together. You can then set the moss ball in a dish or hang it with string. 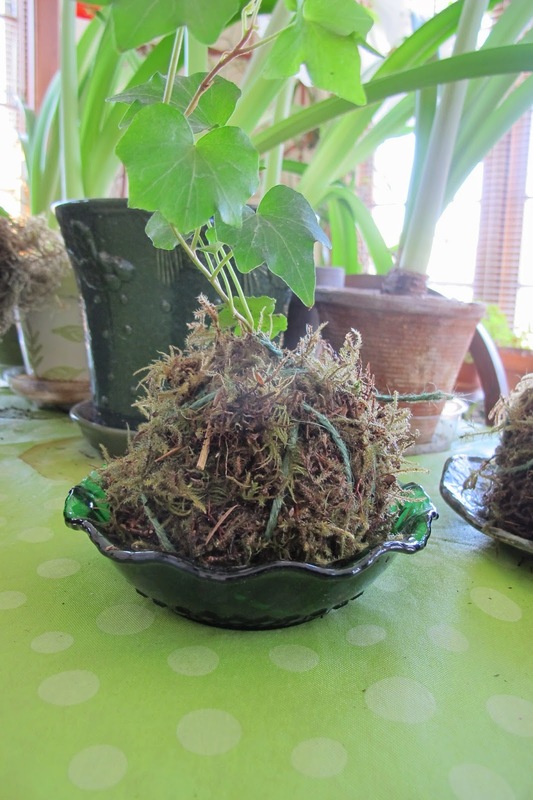 For Kokedama, most people apparently use a clay soil called akadama, so that's what I used. You can get it from anyone who sells bonsai supplies. Now, at this point, I should offer some pictures showing step by step how I made my moss balls, but that would have required me to keep washing my hands to grab the camera and take a picture. Plus, I am not completely satisfied with my first attempt, so I'm going to make some new ones in a few days, with a few adjustments in the soil mix and some fresher green moss. I used some plants I already had on hand for my moss balls. These two were planted with an Iris reticulata bulb on the left and ivy on the right. I have no idea if the iris will grow in that moss ball, but I had it, so I am trying it. I planted this moss ball with a houseplant called turtle vine. Moss ball with turtle vine. 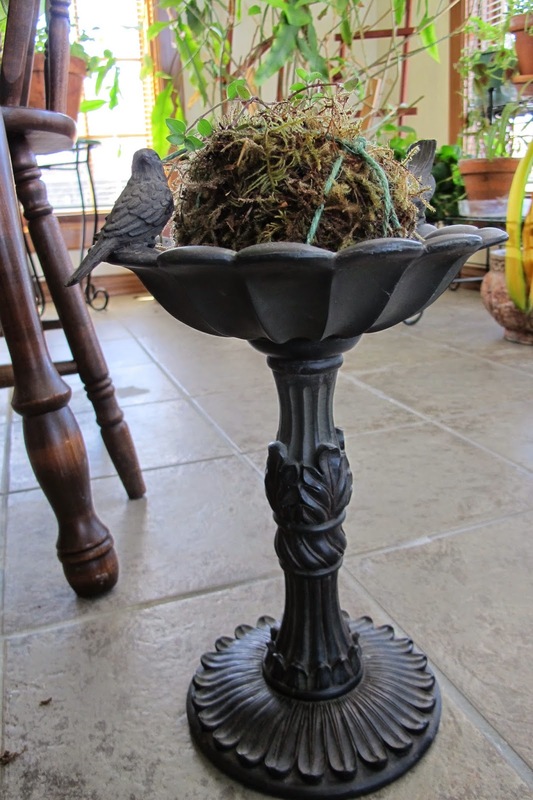 I've had that little decorative indoor bird bath for years and never could decide what to do with it. Now it seems like it was made for a moss ball. The next few days and weeks will tell the tale of my moss balls. Will they fall apart? Will the iris sprout and bloom? What will become of the ivy and turtle vine? When will the green moss take hold of the ball of dirt so I can remove the unsightly string? Will I make another one? I did enjoy making these and I will probably make some more. In the meantime, stay tuned for updates on these, spend a little time over on Pinterest looking at moss balls, and maybe just try it for yourself. And one other thing... Plan to make a bit of a mess if you make your own moss balls. Keep us posted. I'd like to see what they look like a month from now. Oh the things we do to entertain ourselves during winter. It will be interesting to see what happens. Well, I love the idea. It is new to me. I'm watching and learning from you. Very creative. I love it!!! Never knew what they were called! Very interesting! Keep us informed on your progress! I have never heard of kokedama. It sounds quite interesting. What is the advantage of a moss ball? A more humid environment? The aesthetics? They must be quite attractive when they are covered with growth. I suppose some plants grow better in a kokedama than in a pot? What a fascinating project. I can't wait to see what happens. Right now I'm off to Pinterest.